1. I want to take pictures like that. 2. How much of this is edited and how much of it is real photography? 3. Does editing count as real photography? Tonight I busted out my book on my little Canon slr and started reading. I changed some settings around and took a few photos, one of which was of the bananas and ice cream scoop in my kitchen. I also downloaded a new app for my new iPhone 4s called Camera Bag which has several filters to choose from that you can apply to your photos. 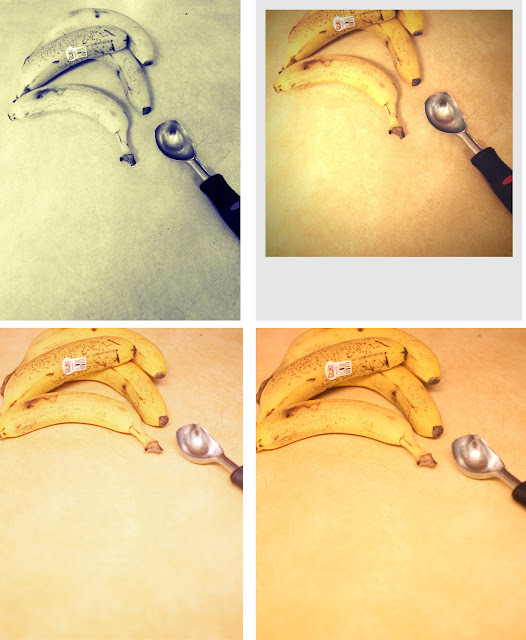 (Top to bottom, left to right) The first photo is an iPhone photo using the silver filter, photo 2 is using the instant filter, photo 3 is from my Canon and edited in Photoshop, and photo 4 is from my Canon unedited. I think it's alarming when my favorites are taken from the iPhone and edited with filters at the touch of a button. Although I like the way they look, I don't feel like I can call that real photography.